This condo features designer decor with granite counter tops in the kitchen and ceramic tile throughout. Beautiful ground floor unit with ocean views. 55" smart TV! 10 foot ceilings in Living Room and Bedroom, large private walled terrace, central A/C, cable, 2 TVs, 2 DVDs, stereo, CD player, sleeper sofa has the newest frame design with memory foam mattress!, fully equipped kitchen including microwave, dishwasher, full size refrigerator with ice maker, ceiling fans, linens & towels provided, no smoking, no pets. Surfside Resort Amenities: Large heated pool, 2 hot tubs, poolside tiki bar, kiddie pool, sauna, skybridge that connects the pool deck with our private beach, private multilevel beach pavilion with a tiki bar and picnic tables, beach volleyball, Royal Palm Grill Restaurant (with room service), interior hallways, fitness room, sports deck - lighted tennis courts, basketball court, volleyball court, and shuffleboard, wireless high speed internet access, video rental, ATM, fax, meeting room and group services, covered parking, security patrol, video surveillance of common areas, barbecue and picnic area, coin laundry. I was born in Ft. Walton Beach and have always loved the area! 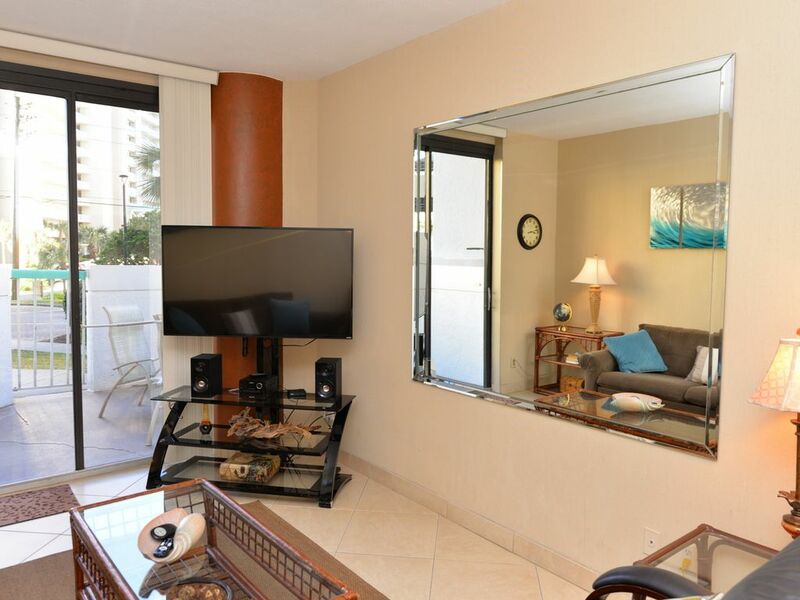 Surfside Resort is in a great location, is well maintained and convenient to everything. We have plenty of amenities too. Free Beach Service (2 Beach Chairs and 1 Umbrella - Seasonal), Private Beach, Private Multilevel Beach Pavilion, Beachside Tiki Bar, 2 Hot Tubs, Large Heated Pool, Poolside Tiki Bar, Sauna, Restaurant, Air conditioned Bar, Spa/Massage Studio, Beauty Studio by Slava, Kiddie Pool, Fitness Room, Lighted Sports Deck (Tennis Courts, Volleyball Court, Basketball Court, Shuffle Board), Beach Volleyball, Covered Parking, Interior Hallways, Wireless High Speed Internet Access, Video Rental, ATM, Security Patrol, Video Surveillance of Common Areas. What a great trip!! Loved the room and the beach was awesome! Roy was super helpful and I would highly recommend anyone staying here in the future. Perfect, relaxing trip with restaurants within easy walking distance even in heels! We really enjoyed this condo! The pictures on here don’t do it justice. Great, easy location. The location, the amenities, the beach chairs and umbrella, the immaculate kitchen and condo - everything was perfect for our family. We were right across the hall from the laundromat which is so convenient with kids!! And being on the first floor was so convenient as well. The pool, hot tubs and beach was surprisingly pretty empty for spring break! We hope to return to this same condo in the future! GREAT Location! Well maintained unit in resort with large beach in quiet location. It is also within walking distance of everything one needs and easy driving distance of most anything one could want. A wide variety of activities in the area to meet the interests of most anyone. Perfect spot for two or three people. So many ammenitie. Unit is well stocked for your stay. Other Activities: RELAXING with a cold beverage!! Tax is 11.5%, there are NO OTHER FEES!!!! Must be 25 years old. Includes FREE BEACH SET UP! !